Put the date in your diaries now. A couple of us RunPals have set ourselvs a ridiculous challenge. A “normal” marathon wouldn’t suffice. 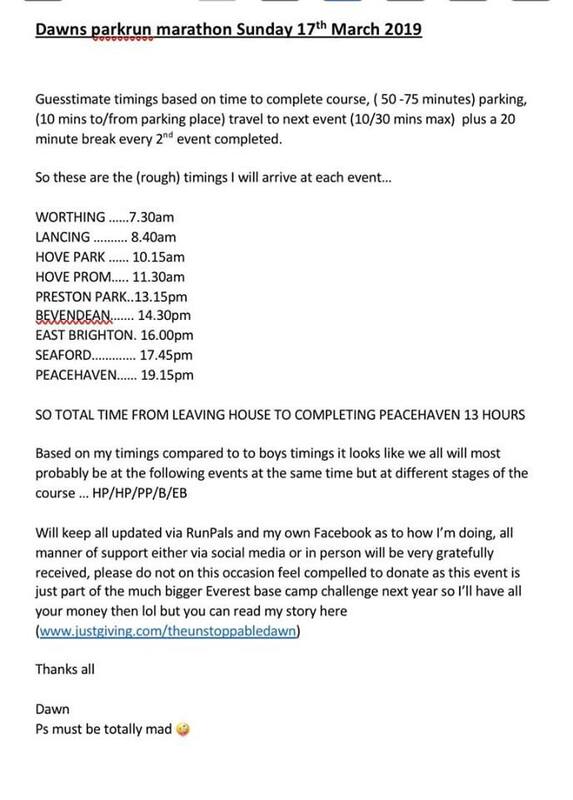 Instead, we are aiming to tour all of the Sussex Parkruns, in one day for some charities close to our hearts. Sounds easy you say, as they’re “only” 5km. But, try running 5km, having a break for half an hour then running another 5…8.2 times! Yea, it’s going to be hard! There are people in this world that need more help than ourselves. my AFK need funding for specialist equipment to help kids lead their life to the full! The planned schedule of runs is below. Note that, we may be slower in some areas or get held up in traffic, or be falling apart towards the end, so the times are for a guide. But hopefully, we’ll get there and look forward to seeing some of you at the various stops! We have put links to all of the locations, so you can see the exact routes we will be running. We would love for you to come and cheer us on. We have no doubt that this is going to be tough and the more support we can get, the better! If you want to join in for a run or a walk of any of the courses, please do come along! We’d love to see you there. This little LEGEND Oscar, is going to join us at Hove Park Parkrun. Can’t wait to run around the course with him! And this is why the fundraising is so important to families that my AFK support. Oscar has received two chairs from my AFK in the past 4 years. His family approached AFK when they realised that their possibilities to have ‘adventure’ as a family were limited due to where they could take Oscar in his chair. As a family they enjoy camping and caravanning but as Oscar was getting older (and heavier) this was becoming a real challenge! They applied for an off road push chair which has had a life changing impact on the way the spend quality family time together. As Oscar was 5 when he received his first chair, 3 years later he had outgrown his first chair and applied for AFK for a second time. This is common with applicants at my AFK and we often support many families over the course of many years- as they face new challenges in life, we are there every step of the way!